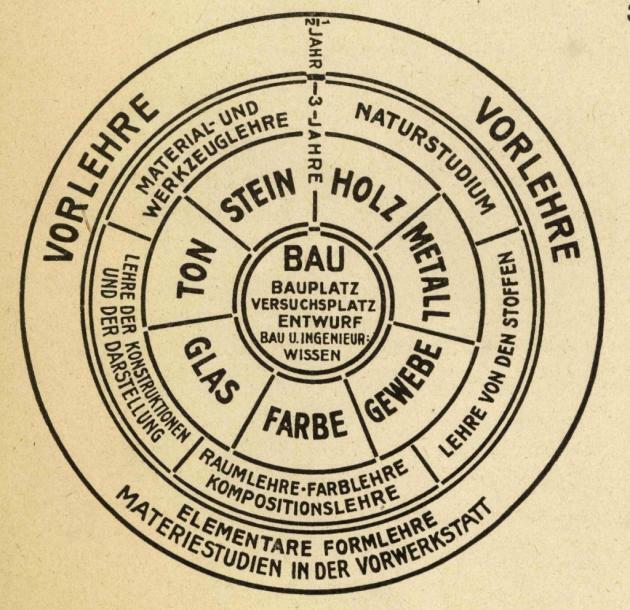 "The individual elements of the Bauhaus teachings are inscribed in a circular shape. The areas of the preliminary course and building are conspicuously delineated from the core of the instruction–the workshops with their accompanying subjects–by a drawn double ring. This is due to the special position that both of these teaching areas occupied: In order to even be accepted to the study programme at the Bauhaus, it was necessary to successfully complete the preliminary course. And only the most talented students could qualify for participation in the building theory course. The schema also indicates the length of the respective educational units." 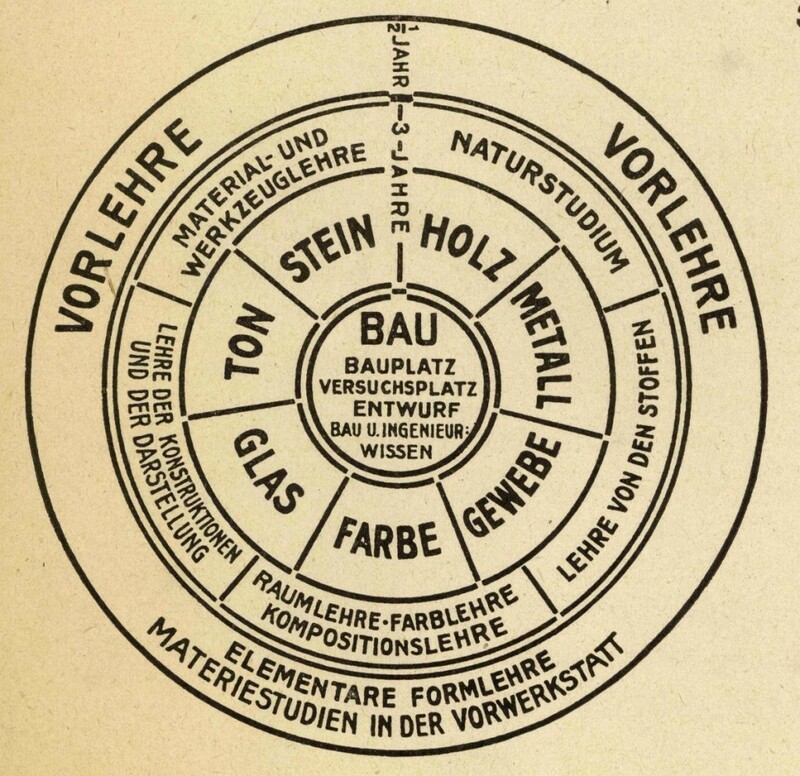 Fig.1 Walter Gropius, Schema zum Aufbau der Lehre am Bauhaus, 1922, veröffentlicht in: Staatliches Bauhaus Weimar, 1919–1923 Bauhaus–Archiv / Museum für Gestaltung, Berlin. "The adaptability necessary to succeed as a design or media specialist comes not only from deep disciplinary knowledge. Graduates also need a breadth of knowledge and skills which some commentators have referred to as being 'T–Shaped'. These additional skills include the ability to work with and increasingly work across disciplines, entrepreneurial attitudes and a knowledge of the business contexts in which they will operate. All undergraduate Ravensbourne programmes incorporate curriculum and learning activities designed to develop these skills in our students. Cross–disciplinary collaborative projects offer students the opportunity to work in teams with other disciplines. The course structure draws on the creative synergies and frictions of the different disciplines at Ravensbourne and provides physical and intellectual opportunities for students to meet, learn and work together with students from different disciplines." "This paper argues that learning outcomes need to be reclaimed from their current use as devices for monitoring and audit, and returned to their proper use in aiding good teaching and learning. We require a broader, flexible and more realistic understanding of learning outcomes, better suited to the realities of the classroom and of practical use to those teachers who wish to respond to the enthusiasm of their students. To this end, a new model is produced that starts from the idea of an articulated curriculum, and embraces both intended and emergent learning outcomes. The model employs the distinction between predicted and unpredicted learning outcomes, together with the distinction between those that are desirable and those that are undesirable. The resulting account is intended to aid understanding of the nature and proper use of learning outcomes in teaching and learning." "This studio course investigates the database as cultural form (Manovich, 2001), in the context of data visualization, digital fabrication, and computational aesthetics. 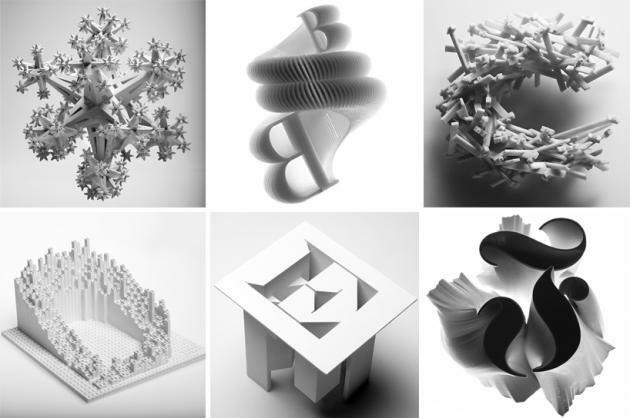 Traditionally viewed as a tool for scientific reasoning and data exploration, information visualization has emerged as an artistic practice, propelled by the democratization of data sources and the advancement of computer graphics. The massive amount of data collected and disseminated online constitutes the basis for this course. Participants will be introduced to the basic skills for developing creative projects in two–, three–, and four dimensions, such as indexes, graphs, prints, digitally fabricated objects and maps. Students will also become familiar with the a basic vocabulary to co–create and collaborate with professionals in future contexts. The course focuses on current standards for web development and mobile applications, including HTML5, CSS3, jQuery, PHP, MySQL, and Processing(.js). Fundamentals in XHTML, Cascading Style Sheets, and programming are beneficial, but not required. Throughout the course, students are asked to utilize the class blog to collect and share resources, collaboratively collecting interesting data sources towards a final project. A series of presentations, screenings, readings, and discussions will expose students to creative projects and artworks in the context of information visualization. Each student selects a research topic followed by an in–class research presentation (see schedule). Participants will also present their work during class critiques and interdisciplinary workshops to receive qualitative feedback from the instructor(s) and the class." Fig.1 Matt Wizinsky (2011). "Chicago unDensity", University of Illinois at Chicago. "Our study was concerned with adapting existing research methods courses to accommodate practice–based research training rather than creating new programmes. Lest we are tempted to develop courses customised exclusively for practice–based research students it is worth noting that practice–based research does not present as a unified mode of studying for a PhD. There are differences between and within subject areas, different modes of study, and there are different outcomes. In the case of PhDs by Composition at the University of Edinburgh, the outcome to be examined is a portfolio of compositions suitable for presentation as a concert programme. No written component is required, other than musical notation and programme notes. ECA defines practice–based research as 'the exploration of a subject of enquiry through practical work accompanied by a related text' (ECA Grad School Student Handbook 2005–2006). The usual model at ECA is for a series of artworks or designs in conjunction with a thesis text, which may take the form of documentation, rationale, justification, position–statement or critique. As mentioned, the strong assertion for practice–based research is that it is no different than any other kind of research, or, at least, it is as different from the rest as they are from each other. Our trial research methods course included students of archaeology, architecture, landscape architecture, history of art, visual and cultural studies, sound design, history of music, furniture design, fine art, sculpture, drawing and painting, and architecture by design. In fact student feedback singled out archaeology and laboratory–based research into architectural structures as having the least support from the course. Practice–based students also found the course content less than satisfactory to their needs, but personal attention from the art–practice researcher/tutor seemed to ameliorate such deficits, and certain lectures would at least make mention of practice–based research, even if to indicate that it may be an exception to the case under discussion. The importance of this basic level of recognition applies equally to transferable skills training. Practitioners singled out time management, scheduling and planning as crucial in the context of exhibitions and performances, involving the management of a range of conflicting variables. We conclude that acknowledgement of practice–based research, along with every other mode of research represented in the class, is the least that can be expected in a research methods course. The minimum provision is for intellectual space for practice–based students to give voice to the issues that affect them, and an invitation to discuss the relevance of the material presented in lectures. A further level of engagement involves exposure to personnel who have an investment in the mode of research under discussion, even if that mode of research is not incorporated into the curriculum. But practice–based research students drew attention to the need for formal practitioner input as vital in delivering insights into ways of working, particularly from those who have already gained PhDs through this mode of study. Practitioner input is to be included within the portfolio of expertise that includes historians, archivists, musicologists, technical experts and information specialists. Whereas it is desirable to inject yet more course content to accommodate the different groups in a student cohort, this recommendation raises the issue of how to do so in the context of a diverse student cohort. Students from all areas reported their appreciation of the chance to study with students from different backgrounds and in different disciplines. Disciplines can be sufficiently different, but with common threads. In the course under study these threads were highlighted in discussions and at the student conference that culminated the course. Learning through a recognition of difference was also emphasized in the course documentation and some of the lectures and exercises. Difference, provocation and appropriation are major stimuli to creative production and can be exploited in a research methods course that supports a diverse range of students. This is abetted by an ethos of openness and conviviality within the course, identifying possible linkages, and teaching staff being open in discussion contexts. A diversity of research methods delivery is a seam to be mined in the case of practice–based research. In this, the potential eclecticism of practice–based research can provide a model for other modes of research, expanding the idea of what a PhD is or can be. None–the–less in our trial course the issue of relevance surfaced frequently. The plan had been to deliver course material of general relevance in a lecture format, open the session to discussion and then provide break–out groups organized along disciplinary lines. In practice, the break–out groups proved too informally constituted to fulfill this purpose, and by this stage in any session the lecturers' and students' appetites for further delivery was diminished. Students wanted to discuss, often across disciplinary lines and according to other than disciplinary configurations. The discussions were regarded as extremely valuable, but not in addressing specific disciplinary needs. There is a need for some classes at least that specifically address practice–based research issues. We conclude that there is value in providing at least one lecture/session on the problematics of research from a practice–based perspective, and involving practitioners. This discussion can also be highly relevant to humanities students whose interest in research may be more eclectic that students in disciplines with a scientific or empirical orientation. Rather than remove practice–based research students from the cohort for special attention, the alternative is to identify students from science–based disciplines, or those working with strictly prescribed methodologies, for alternative instruction. Practice–based students reported their desire to participate in debate and discussion with interested students beyond their own fields. In summary, practice–based research students benefit from working in a diverse context and do not necessarily require their own course. In fact practitioners reported that there are benefits in being exposed to a variety of different approaches which may shed new light on their research, and the opportunity to make interdisciplinary connections. Nor did students demand their own course, just the recognition of the issues that affected their candidature, the introduction of certain themes pertinent to their modes of research, and exposure to experienced practitioners."